25 December 2018 Ashley S. Miller Specialist of Customer Service Dept. Like sharing videos of family and friends online? Place video advertisement on your website? How to protect these videos from being bad using? Adding watermark to video could be the best solution and is widely accepted through the Internet. Watermark could be the text or image including identity or ownership information like signature, company logo, etc. 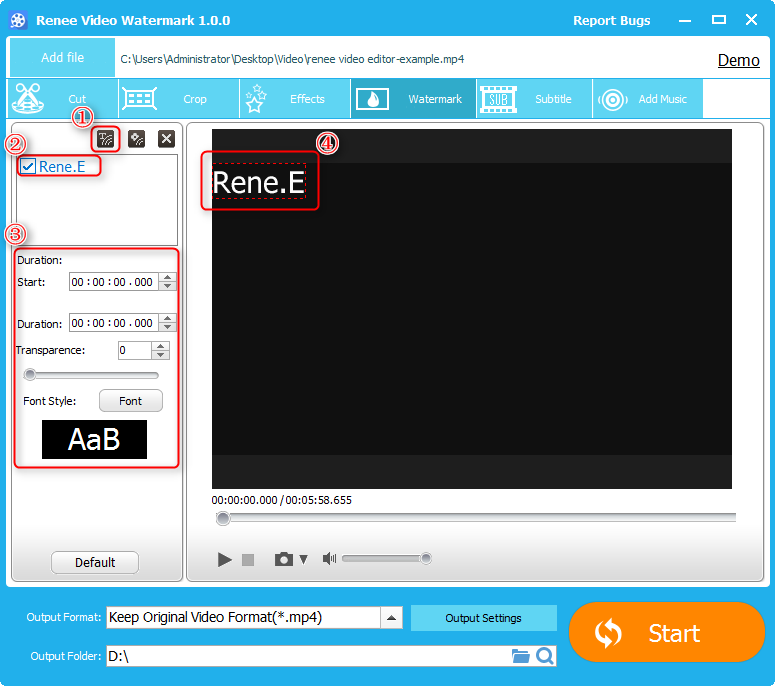 Freeware – Renee Video Editor helps you add the watermark easily? Supports to add watermark to video without limitation. 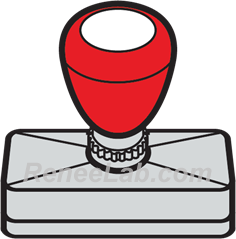 Watermark in text and image are both supported. 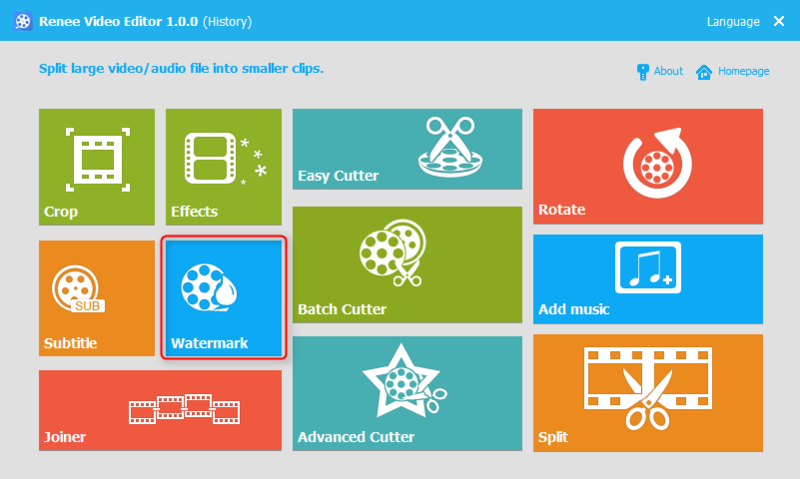 Besides, Renee Video Editor provides more edit tools like remove sound from video and add background music, trim unwanted parts from video, convert videos into different formats, cut videos into parts,etc. Step 1: Launch Renee Video Editor. Go to “Watermark“. Then add target video. Step 2: Add text watermark and then make the related settings. ① Click to add text watermark. 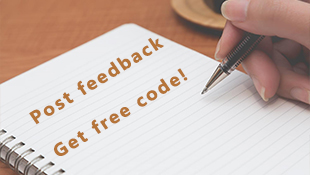 ② Edit the text you want. ③ Make the related settings like when to start, duration, font style, etc. ④ Set the location of the text watermark. Step 3：Add image watermark and then make the related settings. ④ Make the related settings like when to start, duration, transparency, etc. Step 4：Select the output format and then click “Start” to export the video! Add your own watermark to your video now! 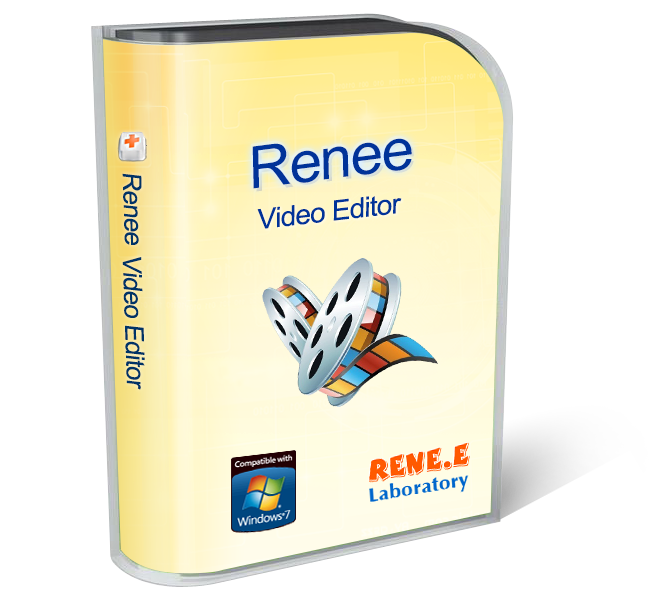 Protect the ownership with Renee Video Editor!